Isn't everything better with cats? Inspired by one of the most iconic photographs of all time, Lunch atop a Skyscraper, comes this purr-fect postcard for cat lovers everywhere. 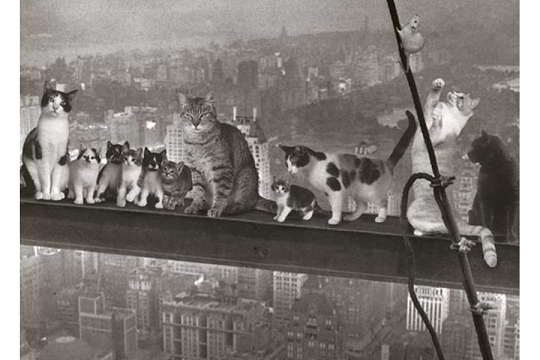 Eleven (5 full grown and 6 kittens) of our dear feline friends sit atop a girder as a skyscraper is being built. None of which appear to be suffering from acrophobia, one even standing on its hind legs in an attempt to catch a mouse. The original photograph shows 11 workers having lunch while working on what would be the RCA building (commonly referred to as 30 Rock now) at Rockefeller Center. While the image was not as impromptu as they led people to believe, it is still an amazing portrait of the working man of the day.